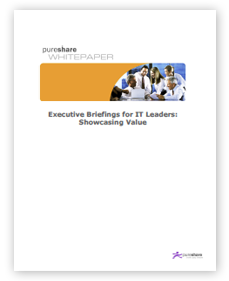 The techniques outlined in this whitepaper will help you directly influence the leadership of your organization through effective executive briefings. Explore different types of briefings and learn how to leverage them in every situation so stakeholders can get to the answers they need quickly and effortlessly. Learn the best way to select metrics, highlight strategic insights and leverage best practices in visualization – while avoiding the pitfalls of traditional dashboard and reporting tools. Download this whitepaper and get a jump on what IT leadership needs – truly effective executive briefing.